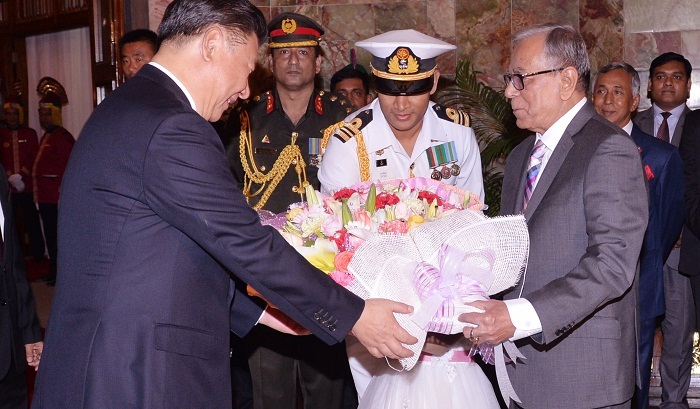 President Abdul Hamid on Friday entertained visiting Chinese President Xi Jinping with Dhakai Kachchi Biriyani, Shami Kabab and Aloo-Bukhara chutney as he hosted dinner in honour of his Chinese counterpart at Bangabhaban. The Bangladesh President laid out 10 items on the menu for the dinner held at the Darbal Hall of the presidential palace, UNB reports. Prime Minister Sheikh Hasina, Speaker Shirin Sharmin Chaudhury, Chief Justice Surendra Kumar Sinha, former President and Prime Minister’s special envoy HM Ershad and entourage of the Chinese President, among others, attended the dinner. Poached giant king prawn and cream of mushroom soup were served to the guests as starters while smoked Eel fish on crispy salad bed with a drizzle of light oyster sauce was there as Entrée. Chicken Tikka, Kachchi Biriyani with Shami Kabab served with minted house sauce and poppadum; Szechuan style shredded beef with onions, capsicum and mixed vegetables and plain rice were served to the guests as main dishes. The high-profile guests got traditional malai chop, seasonal fresh fruits and petit fours as dessert. Prior to the dinner, a cultural programme was organised in honor of Xi Jinping at the Drabal Hall with artistes from Shilpakala Academy performing there. Foreign Minister AH Mahmood Ali, State Minister for Foreign Affairs M Shahriar Alam, Foreign Secretary M Shahidul Haque, President’s Military Secretary Major General Abul Hossain and the Press Secretary Joinal Abedin were present. Earlier, Xi Jinping had a meeting with Abdul Hamid at the Cabinet Hall of the presidential palace. The Chinese President also signed Visitor’s Book at the Bangabhaban.